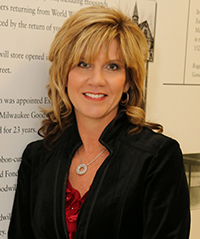 In May 2012 the Board of Directors of Goodwill Industries of Southeastern Wisconsin (Goodwill) selected Jacqueline (Jackie) Hallberg to succeed John L. Miller as Goodwill’s next President and CEO. She assumed those duties on January 1, 2013. Goodwill is a non-profit organization with a mission to provide training, employment and supportive services to individuals with disabilities and disadvantages that are seeking greater independence. Goodwill’s service territory includes southeastern Wisconsin and the metropolitan Chicago area. In 2017, Goodwill had operating revenue of $312 million and over 6,200 employees. Jackie has more than twenty years experience developing and implementing innovative workforce development programs and leading large-scale operations that provide employment, training and advancement for individuals with disabilities and disadvantages. Jackie has a Bachelor of Science Degree from the University of Wisconsin-Stevens Point, and a Master of Public Administration from the University of Wisconsin-Milwaukee. Jackie joined Goodwill in 1990 as the Manager of Programs and Administrative Operations in Kenosha and Waukesha Counties. In 1996 she was promoted to Director of Kenosha County, WI and Lake County, IL Programs and played a key role in the development and oversight of Goodwill’s operations at the nationally recognized Kenosha County Job Center, the nation’s first one-stop job center. In 1999, Jackie was appointed Executive Director of GWS, Inc., a Goodwill subsidiary organization with contract responsibility for food service and administrative services at Naval Station Great Lakes through the AbilityOne Program. After several promotions, she became Senior Vice President, Federal Services. In that role, Jackie led the strategic direction and operation of Goodwill’s federal contracts at Naval Station Great Lakes, which employed over 700 individuals with significant disabilities and became the largest service contract in the federal AbilityOne Program. In 2009, she assumed the role of Senior Vice President, Federal Services and Business Development, in which she focused on advancing Goodwill’s mission-related business development through innovative programs and services, organizational change, talent development and oversight of Goodwill’s full-service staffing agency. In addition, Jackie has been the recipient of several awards over her career, including the Robert E. and Charlotte Watkins Award for Mission Advancement from Goodwill Industries International in 2007. Jackie is responsible for the largest Goodwill in North America with nearly 100 locations and 67 Goodwill Store & Donation Centers. The organization provides an array of services and programs for individuals with barriers to employment. Goodwill delivers on its mission through diverse operations, including workforce development programs, supportive services, Retail Services, Goodwill E-cycle, our electronic recycling business, a commercial laundry, federal contract work at Naval Station Great Lakes, and TalentBridge, a full-service staffing agency. Continuously CARF accredited since 1972, Goodwill is also ISO-9001 certified since 2006. In 2017, Goodwill Industries of Southeastern Wisconsin and Metropolitan Chicago provided services to 62,173 individuals. At the end of 2017, the organization employed a total of 6,202 individuals, which includes 701 men and women with disabilities.